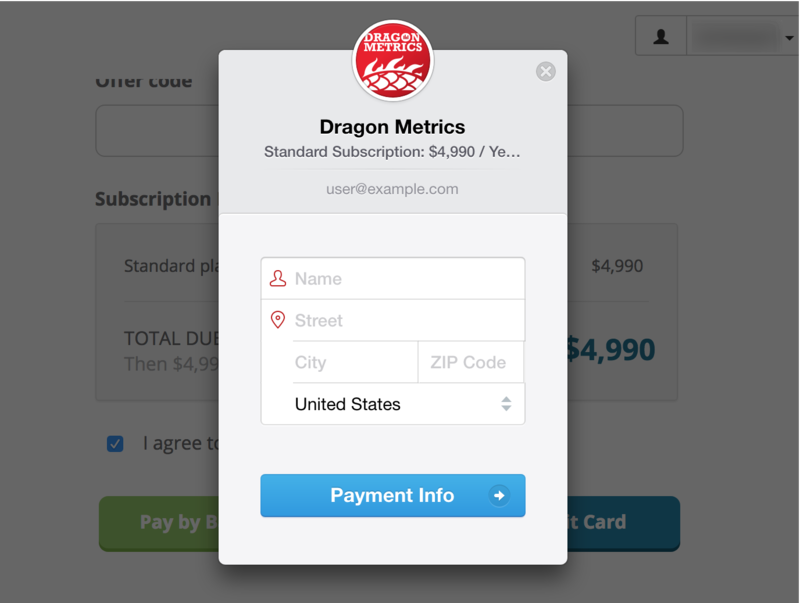 How do I purchase a full subscription of Dragon Metrics? You will then be presented with our pricing page, with all available plans and options, with details and FAQs you will need to pick the plan that suits your needs (These information are also available on our website). If your trial account has expired, you will not be able to access the app as normal, instead you will see our pricing page as well. Payment Terms - Monthly and Yearly payments are available. We offer 2 months free for Yearly payment users, which means yearly payment users will only need to pay 10 months in advance to enjoy 12 months' access for their selected subscription level. Ranking Update Frequency - Keyword ranking data can be updated Weekly or Daily. If you choose to having weekly updated ranking, you will be receiving ranking updates for your keywords every week at the same weekday (E.g. Every Monday). 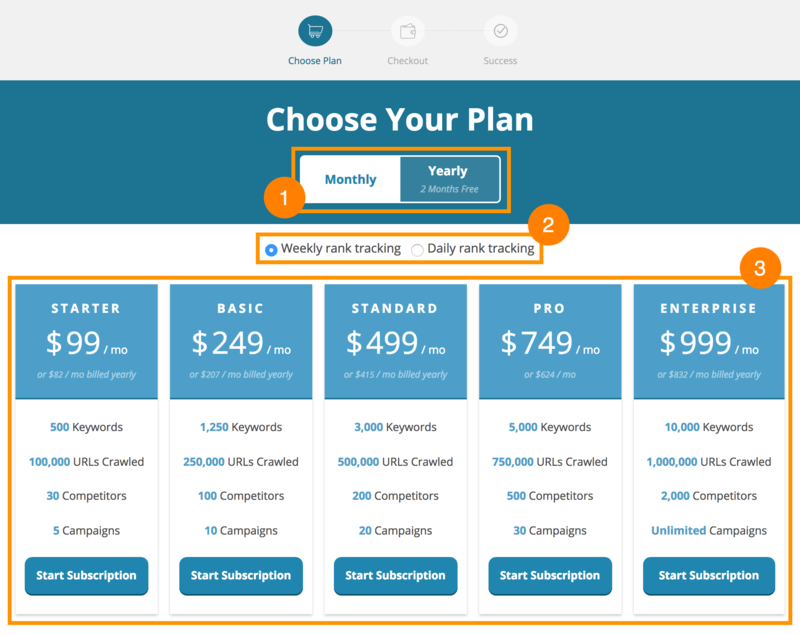 Plans - Determine the volume of various data types we will support for your account like the amount of keywords you can track, number of URLs we will crawl and backlinks we will track etc. If none of our stock plans seems to meet your requirements, feel free to get in touch and we'd happy to assist. 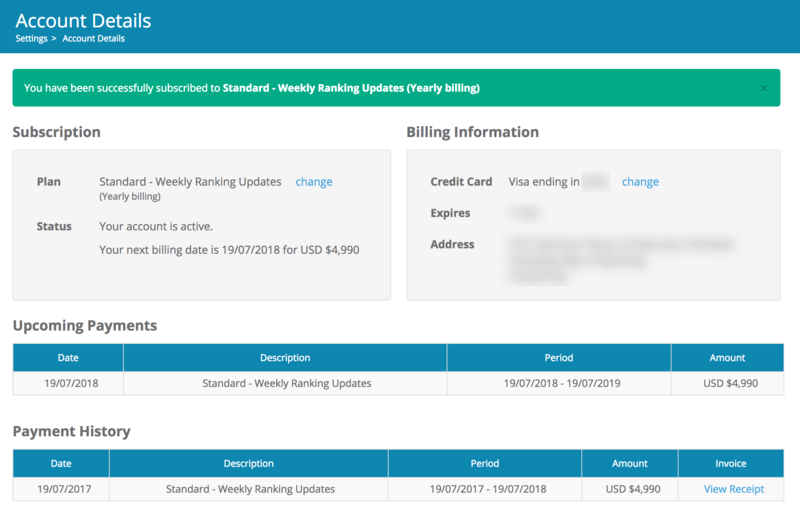 Choose your preferred Payment Terms and Ranking Update Frequency, then click on the Start Subscription button under the plan you are looking to subscribe to. In this page you also need to read and agree to our terms of service, once you've done so, click on the check box and choose your preferred payment method, either via Credit Card or Bank Transfer. Note: For monthly subscription users, Bank Transfer is available for Standard or above subscription levels and it will be available for all yearly subscription users. Enter information as the popup modal required and we will try to process your payment. If you are having problem with your payment, please contact our support for help. 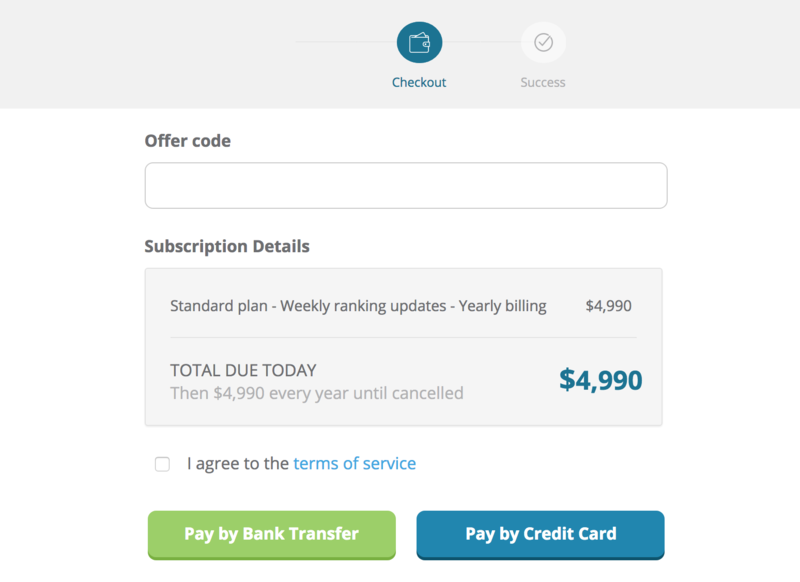 As long as the account's subscription is valid, this page will be the page where you can manage your subscription and billing information, view payment records and download invoices. Alternatively if you click on Pay by Bank Transfer, you will be asked to enter your company's information for our system to generate invoices based on your order details, once you've done entering necessary information, click on Download Invoice. A PDF invoice will be downloaded to your computer and you can pass this file along for your company's further handling. 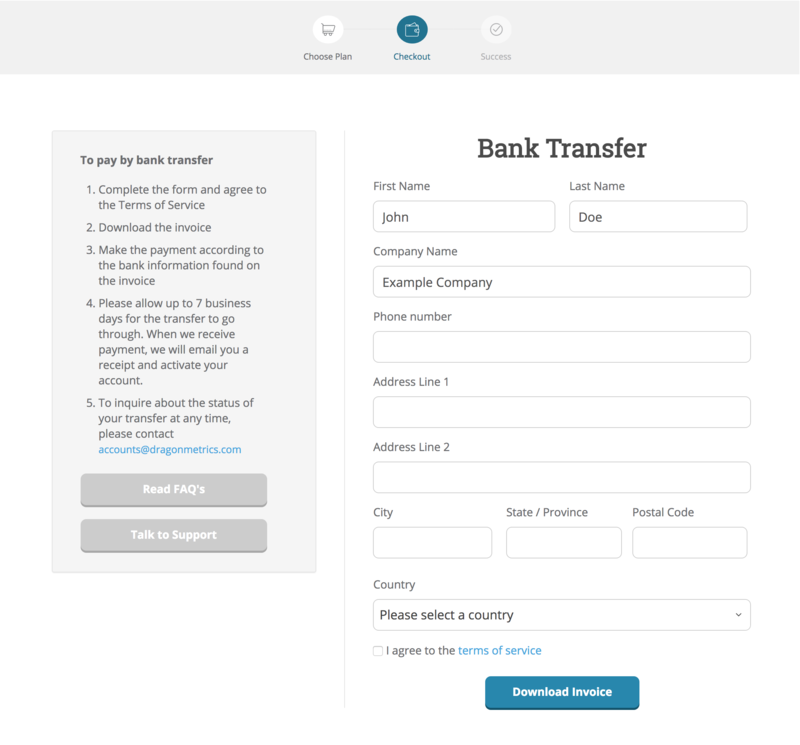 More detailed instructions for Bank Transfer payment are also displayed on the page.